Equal Approach placed 116th in the Stonewall Workplace Equality Index 2017, out of over 430 organisations across a range of sectors and regions that took part. The Stonewall Workplace Equality Index is a powerful benchmarking tool used by employers to help ensure all lesbian, gay, bi and trans employees can be themselves in the workplace. Those who take part know that people perform better when they can be themselves. Organisations then receive their scores, enabling them to understand what’s going well and where they need to focus their efforts, as well as see how they’ve performed in comparison with their sector and region. The 100 best performing organisations are celebrated publicly. 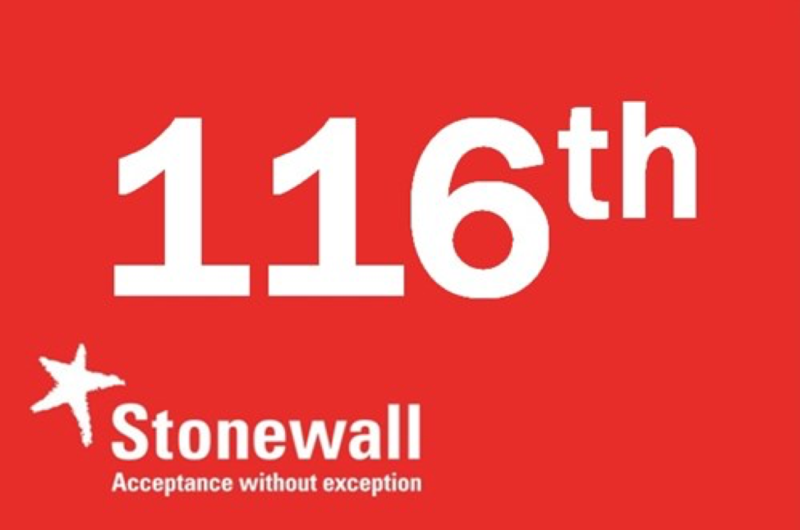 “Equal Approach entered the Stonewall Equality Index for the first time in 2017, placing just outside of the top 100, at a respectable 116th. This is a real achievement for their first entry into the index. Equal Approach has been working within the Diversity and Inclusion space for a number of years and this includes LGBT+ inclusion, so it is no surprise they have done so well. Star performers: Accenture, Barclays, EY, Gentoo, Goldman Sachs, Home Office, Nottinghamshire Healthcare NHS Foundation Trust and Simmons & Simmons.